Glasgow isn’t noted for its fine weather but whenever I visit it the sun comes out. 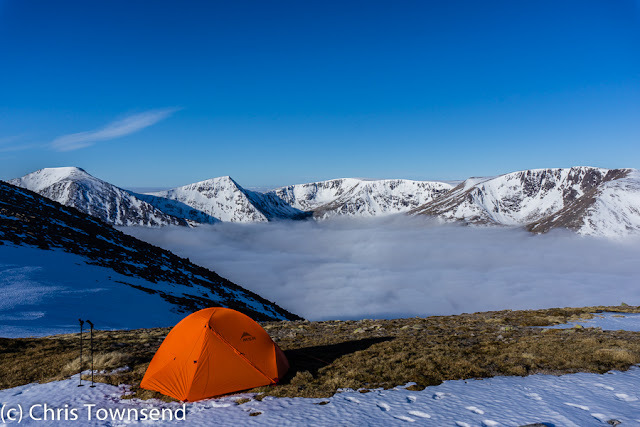 So it was last weekend when I was there to give a talk at Mountain Aid’s excellent Skills for the Hills event and talk to people on The Great Outdoors stand. A hot sunny Saturday was spent indoors in a city. It was an enjoyable event though and I had many interesting conversations. As someone whose work is mostly solitary, sitting at a desk looking at a screen, it’s always good to meet real people – especially ones who like my writing! Checking the forecast it looked as though the good weather should last a few more days in the Eastern Highlands so once I was back home I made plans for a quick overnight trip onto the Cairngorm Plateau. What I found were perfect spring conditions. 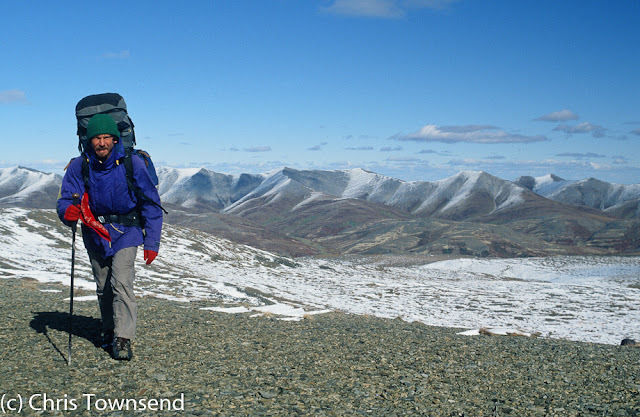 The sun was hot - on both days I walked in a thin base layer with the neck unzipped and the sleeves rolled up – but there was still much snow, some of it so hard and icy that I wore crampons for the first time this snow season. There was no wind and whenever I paused all I could hear was the vast silence. 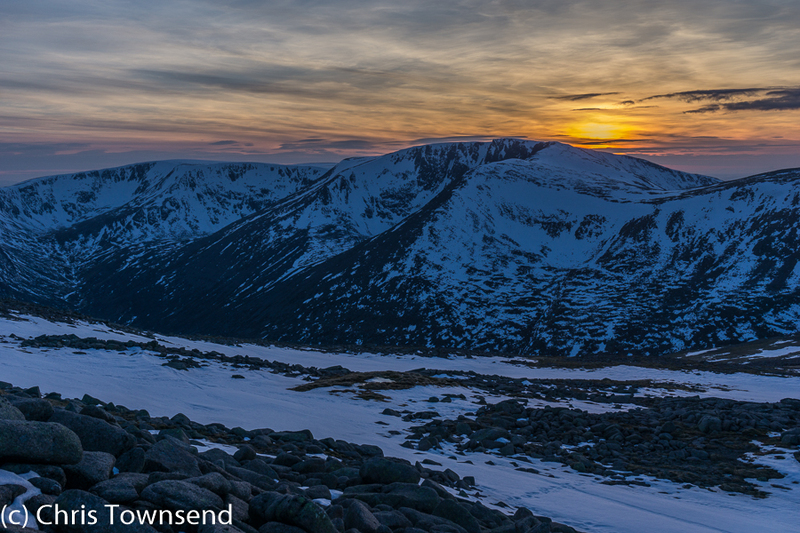 I was pitched not far from the snow-covered Allt a’Choire Mhoir. 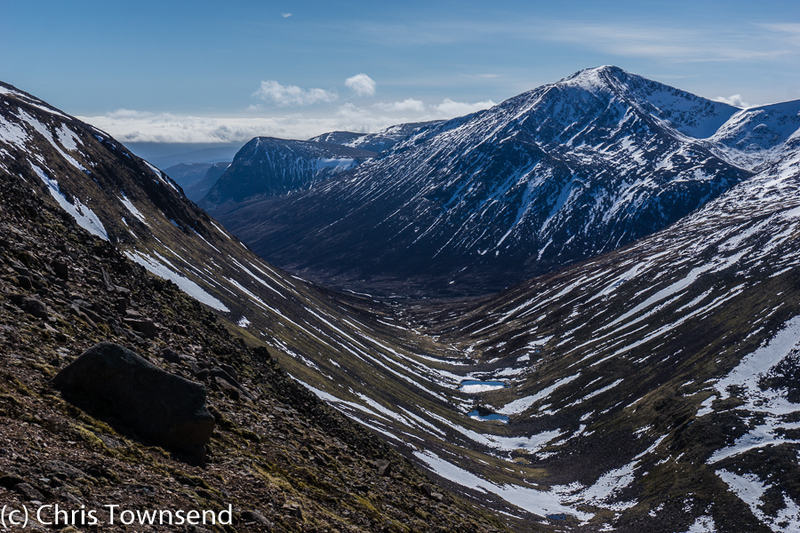 With my headlight on I followed the stream downwards hoping to find running water so I didn’t need to melt snow. Soon I could hear but not see water. I kicked at the snow. It was hard and I didn’t make much impression. However I had a snow shovel back at camp and once I’d fetched this I soon broke through the foot or so of snow to cold fresh water rattling over granite slabs. A gusty wind rattled the tent in the early part of the night and I wondered if the weather was changing sooner than forecast. The sky was clear and bright with stars however. Given this I was surprised that the temperature only dropped to -1°C, just low enough for a skim of ice to form on my water bottle. Dawn came with a spectacular surprise. 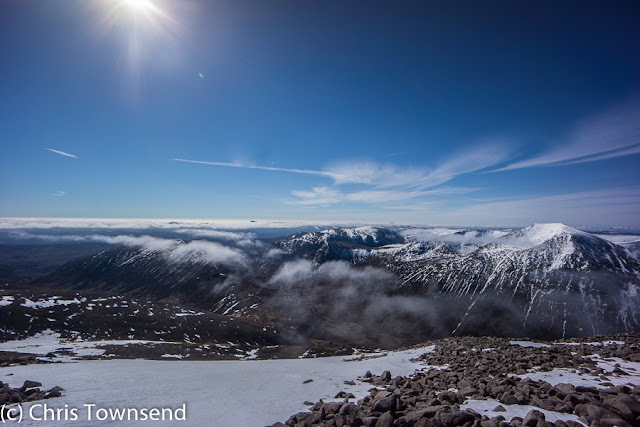 The Lairig Ghru was filled with grey undulating mist above which the great snow-streaked peaks of Cairn Toul, Sgor an Lochain Uaine and Braeriach shone in the sun. I sat and stared. This was tremendous. A perfect start to the day. Breakfast was outside in the sunshine watching the mist rise and fall. The night wind had gone and the air was still. The harsh rasping cry of a ptarmigan rang across the rocks. From somewhere far below in the mist I heard a rumble and crashing – rocks released from the snow as it melted. Otherwise all was quiet. A pretty little snow bunting fluttered over the ground, pecking at the sparse grass and waiting, I suspect, for me to leave so it could scavenge for any scraps. 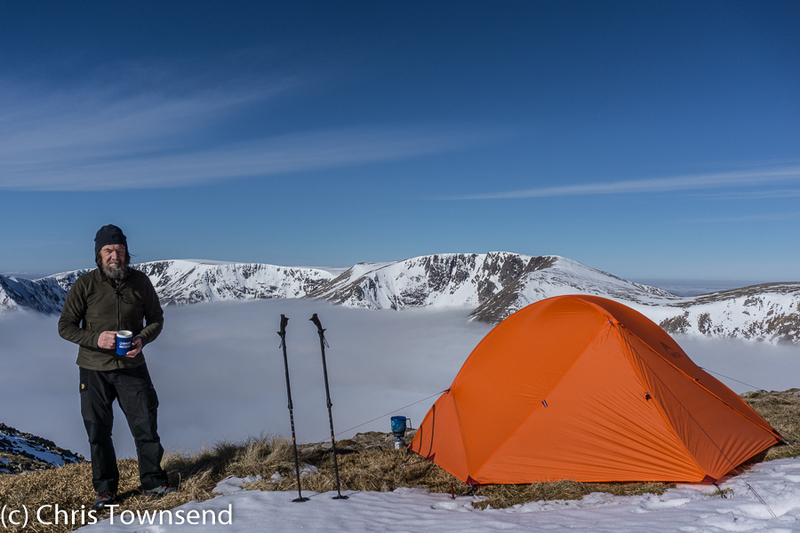 Eventually I managed to pack up and leave this wonderful camp and head up to the summit of Ben Macdui. The views remained superb though from the higher vantage point I could see that south and west the farther peaks were mostly hidden in cloud. From Macdui I crossed the Plateau watching the shining mountains. A last view down into the Lairig Ghru and out south to hazy hills and I began my descent feeling very, very satisfied. 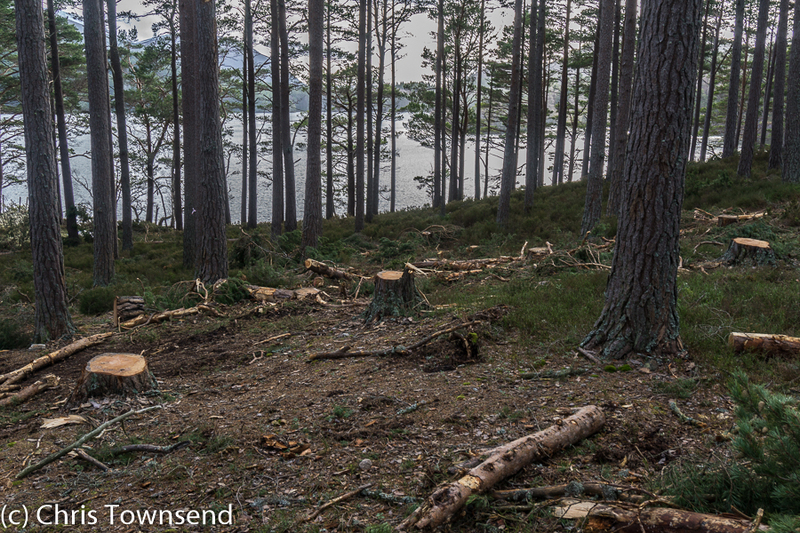 Forest destruction at Loch an Eilein: Is this conservation? Recently I visited Loch an Eilein in Rothiemurchus Forest for a relaxing walk in natural woodland. 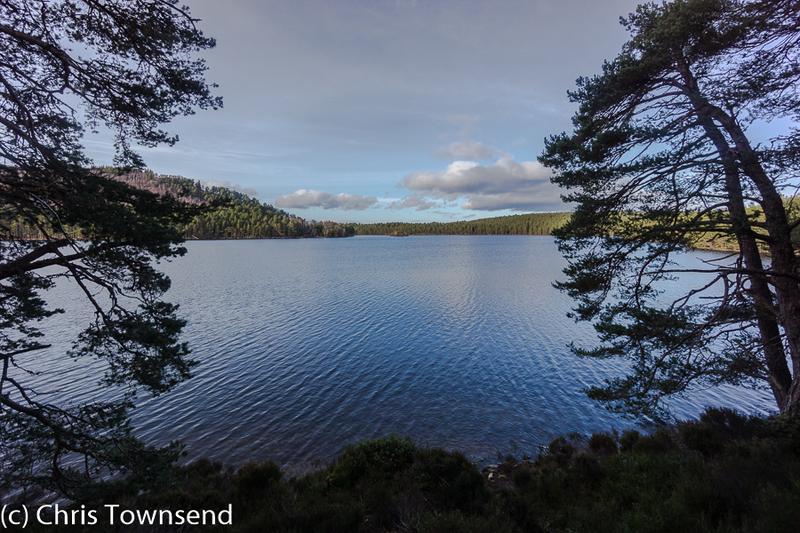 Loch an Eilein is, rightly, a popular spot as you can drive there and the walk round it is on good tracks and paths. I intended extending the walk a little by also going round smaller Loch Gamhna which is linked to Loch an Eilein by a very short stream. 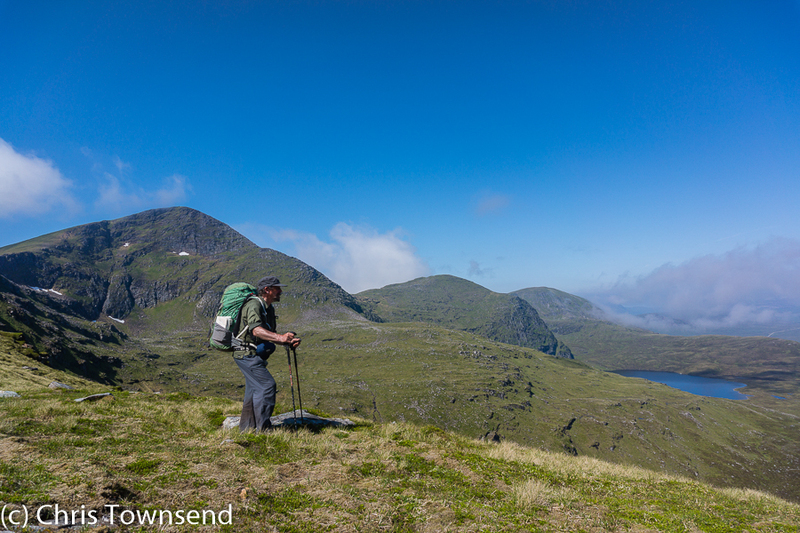 The path round Loch Gamhna is much rougher and fewer people go this way. Arriving at the loch shore I found signs warning of felling taking place. Felling? Here? At Loch an Eilein, a jewel in the forest? 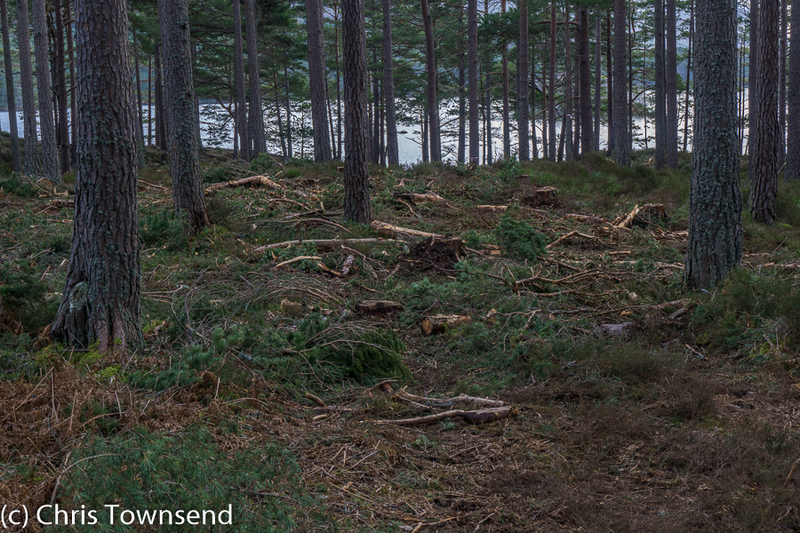 Heading clockwise round the loch I soon came upon the first cut trees. This is native pine forest with rich ground vegetation beneath the trees and many open areas, some marshy, some where trees have been blown down by the wind. It’s as far from a plantation of closely-spaced identical rows of trees with no vegetation underneath as can be imagined. Why is this forest destruction, for that is what it is, taking place? There were signs to enlighten me. ‘We love trees’, one said, followed by ‘thinning and regeneration felling allows trees and ground vegetation to grow back’. Really? How about not destroying them in the first place so they don’t have to grow back? 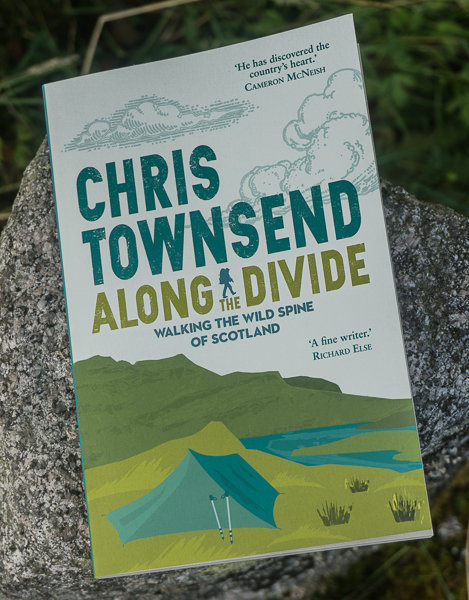 ‘Some trees and branches are left in the forest to provide deadwood for insects and fungi’. Note the ‘some’. The rest I presume is sold. The forest is full of deadwood anyway. The signs claimed the felling will ‘improve’ the forest. Like hell it will. 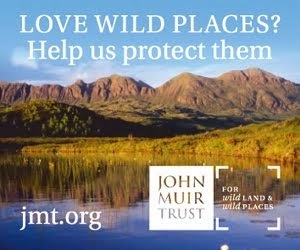 Apparently Scottish Natural Heritage helped with the planning. It should be ashamed. 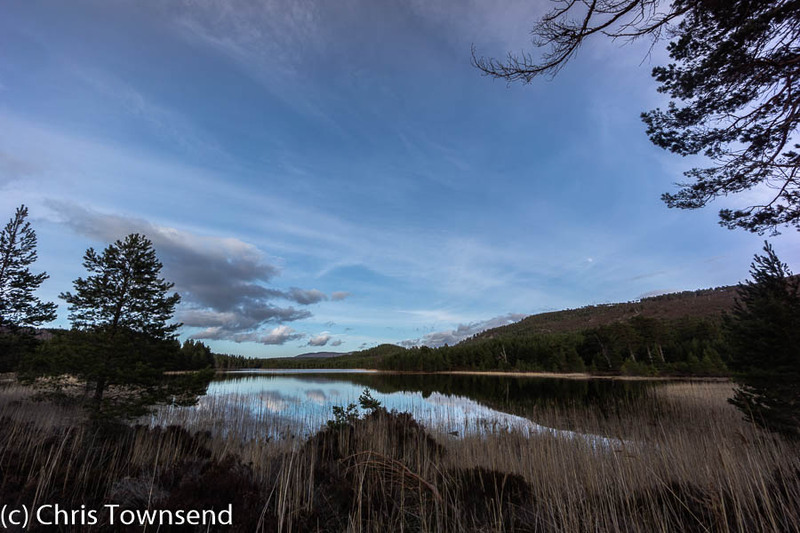 There's no mention of the Cairngorms National Park in which Loch an Eilein lies. Does it have an opinion? Does it know? 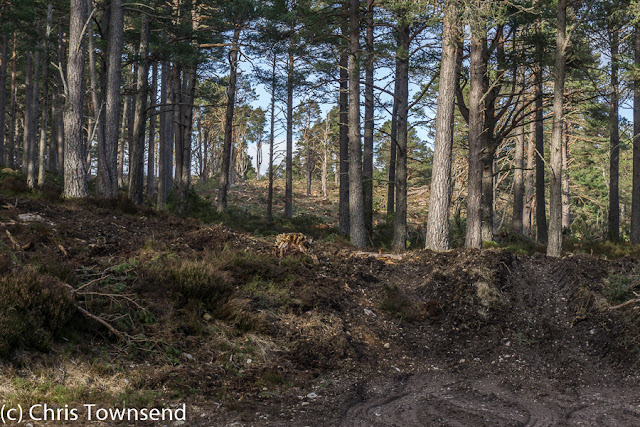 ‘If the area is not disturbed or trampled, heather and blaeberries will grow back and wildlife will move into this area’ – wildlife that has been driven out by the felling and heather and blaeberries that have been trashed by it. 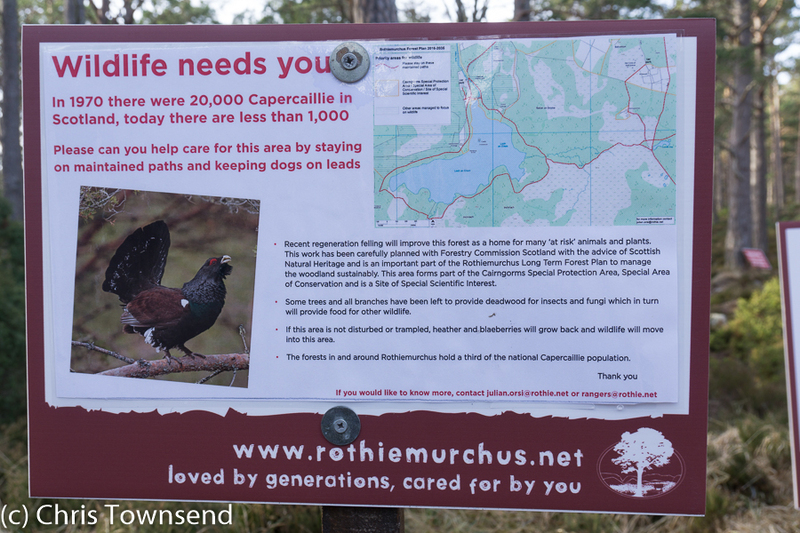 To add to the insults there was also a request to stay on maintained paths to help the wildlife. I guess heavy machinery destroying their habitat doesn’t harm them. 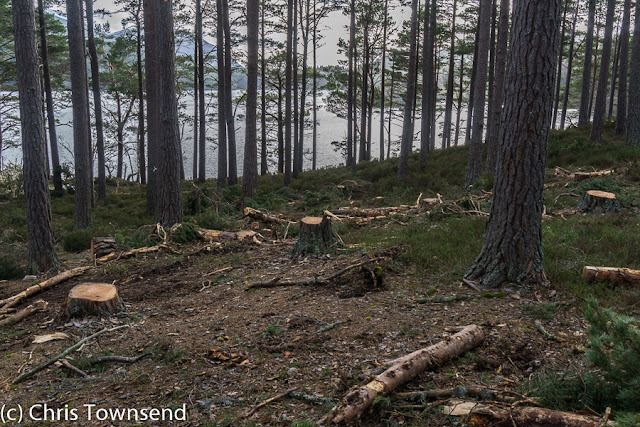 I’m sure Rothiemurchus Estate can come up with more justifications for this logging. I’m sure too that they will all be spurious. A natural forest has been badly damaged by the people who are supposed to care for it. There was no need for this. It’s just vandalism. This forest should be left alone. There is no need to ‘manage’ or ‘improve’ it. Having passed through the extensive desolation I felt angry and tense. So much for a relaxing walk. It took some time before the beauty of the rest of the area calmed me down and I could enjoy being here. I won’t forget though. March 27. 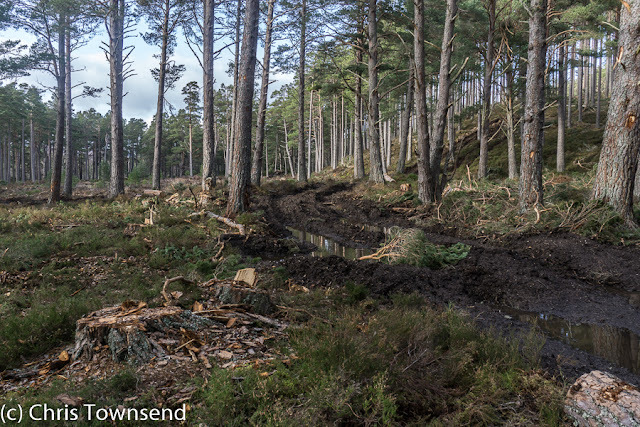 Nick Kempe has posted an excellent follow-up to my post on ParksWatch Scotland that goes into the details behind this felling. It's well worth reading. Following on from my post about the gear I used in 1990 and 2013 on my Yukon and Scottish Watershed walks here's some notes on my photographic gear for those trips. The Yukon walk took place long before digital photography arrived and I took two 35mm film SLR bodies, the autofocus Nikon F801 and the manual Nikon FM2. These were quite heavy but tough and the F801 had one big plus - a thirty-second self-timer that made taking pictures of myself hiking or doing camp chores easy. In 1990 wide angle zoom lenses also hadn't arrived, at least not ones that were any good. My lenses were a Nikkor 24mm F2.8, Nikkor 35-70 F3.3-5.6 zoom, and Sigma 70-210 F4.5-5.6 zoom. I had a tripod too, called the Cullman Backpack. The cameras and lenses were carried in well-padded and tough Camera Care Systems bags. The total weight of my camera gear was just over 4kg (9lbs). 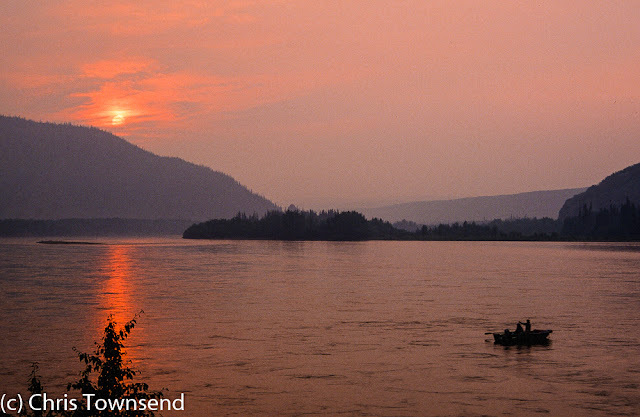 In the appendices to Walking the Yukon, my book on the walk, I wrote that this was 'very light for an SLR system'. It sounds very heavy to me today. All my pictures were taken on Fujichrome 50 and Fujichrome 100 transparency film. I shot 66 35-shot rolls during the 83 day walk, 2,310 images in total. Many were duplicates though as I couldn't see the results until after the walk and so often bracketed exposures. Films went ahead in resupply boxes and were sent home in batches for processing. In 2013 my camera gear was completely different. I'd converted to digital ten years earlier and then changed from SLRs to smaller, lighter weight mirrorless cameras in 2010. My camera bodies now were the Sony NEX 6 and NEX 7, my lenses the Sony E 16-50mm F3.5-5.6 and 10-18mm F4 (35mm equivalents 24-75mm and 15-27mm). They were carried in Camera Care Systems and LowePro cases. My tripod was a Velbon V-Pod. The total weight was 1.85kg (just over 4lbs), less than half that of the Yukon gear. I didn't need to carry film (28.35 grams a roll ) either. Instead I had several memory cards that weighed less than one roll of film. 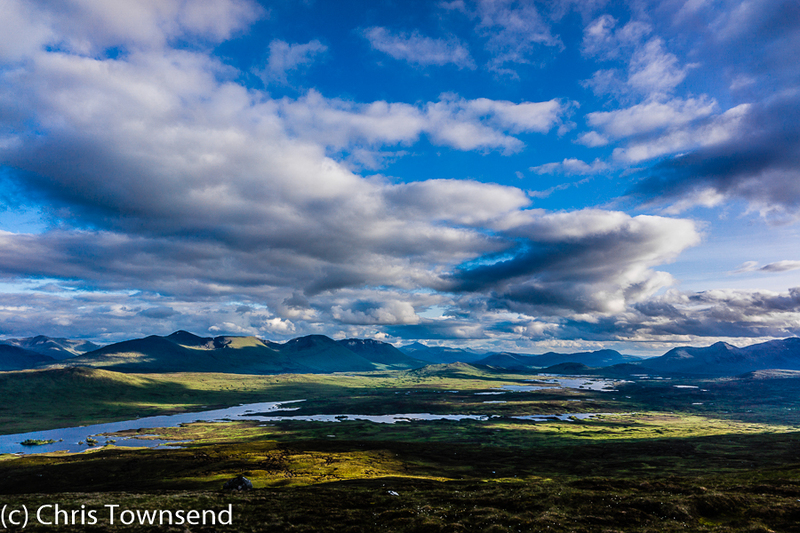 I ended up with 1620 images for the 55 day walk, not including those I shot on my smartphone. I was able to check the images too and so could delete images and retake them if necessary. Last autumn I took almost the same camera gear on my Yosemite to Death Valley walk, the only changes being a Sony a6000 body instead of the NEX 6 and ThinkTank Mirrorless Mover 5 and Mirrorless Mover 10 cases. The light weight, low bulk, and the convenience of digital with no films to deal with, a histogram for exposure, and being able to check images makes this set-up far preferable for long-distance walking to my old film camera gear. I do miss that 30 second timer though. On March 25 Mountain Aid is holding a Skills for the Hills event in Glasgow Royal Concert Hall. I'll be giving a talk on Gear for the Hills on behalf of The Great Outdoors at 2pm (the event runs from 10am until 4.30pm). 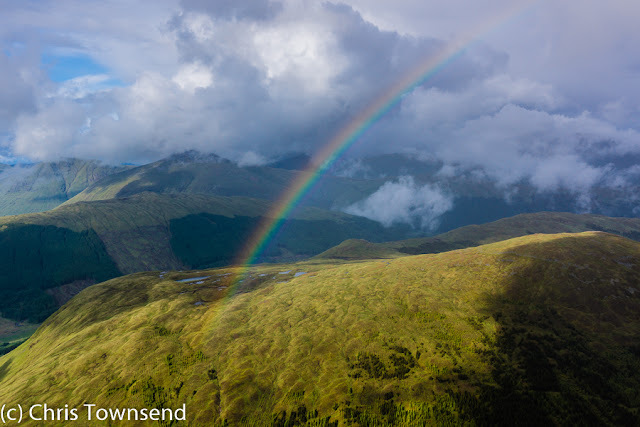 Other speakers include Cameron McNeish on Words in the Landscape, and Heather Morning of Mountaineering Scotland on Skills for the Hills, Discover your Adventure. There'll be a Q&A after each talk. 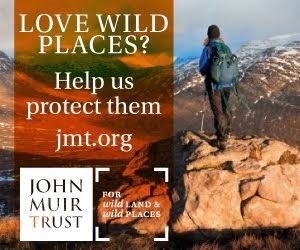 There will also be exhibits from a wide variety of organisations and companies including the John Muir Trust, The Great Outdoors, Walk Highlands, Scottish Avalanche Information Service, Adventure Medical, Harvey Maps, Anquet, Cicerone, Mountain Bothies Association, and the Mountain Weather Information Service. Entry is £2. It looks like a great day out! 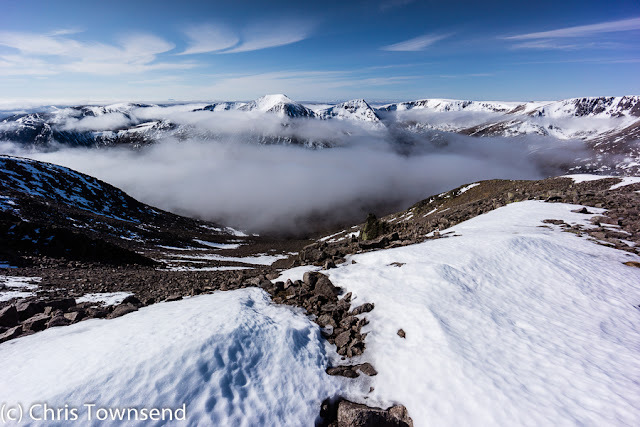 Mountain Aid is a charity dedicated to promoting safety in the Scottish hills. In 1990 I walked 1000 miles/1600km through the Yukon Territory from south to north. In 2013 I walked 700 miles/1200km along the Scottish Watershed. Both walks were in rough often boggy, often rocky country with few paths. 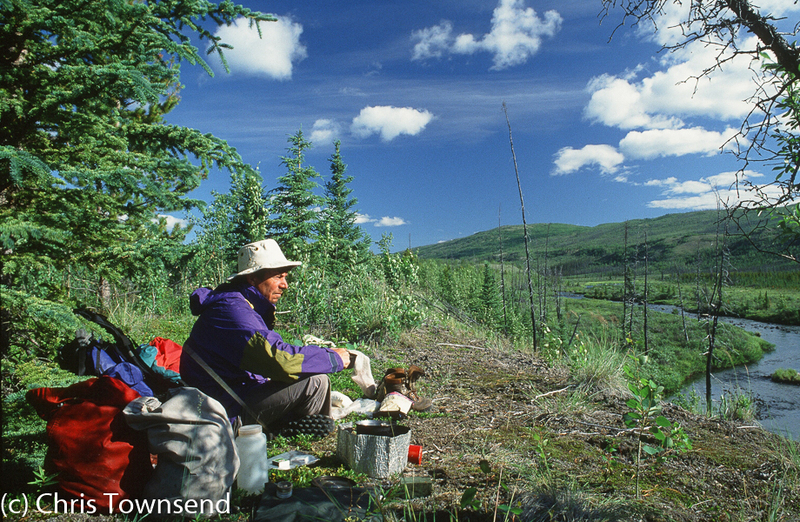 In the Yukon my pack weight averaged 22-28kg, on the Scottish Watershed it was 12-18kg. 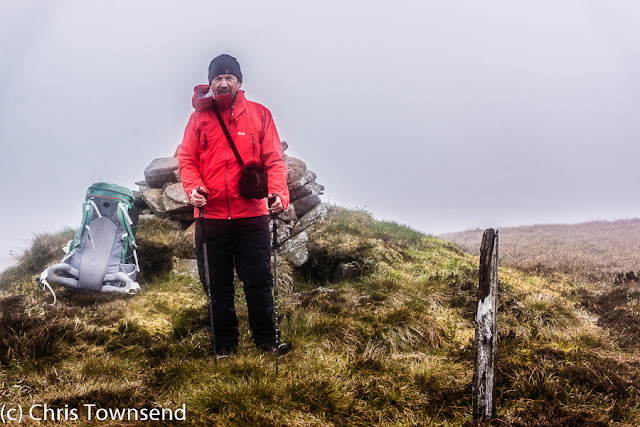 Here I’ve looked at the gear I used for each walk and how it has changed. Yukon: Vasque Summit leather boots weighing 3.5lbs/1.6kg that easily lasted the whole walk. I chose these boots because although I had already done much walking in trail shoes I wasn’t sure they’d stand up to the rugged terrain. Watershed: Inov8 Terroc trail shoes weighing 1.5lbs/698 grams, less than half the weight of the Yukon boots. At the end of the walk the sole was quite worn down but the uppers were still in good condition. The Terrocs were far more comfortable than the boots. I wouldn’t go back to the latter. Yukon: Phoenix Phreeranger single-hoop solo tent with a PU coated outer weighing 4lbs/1.8kg. 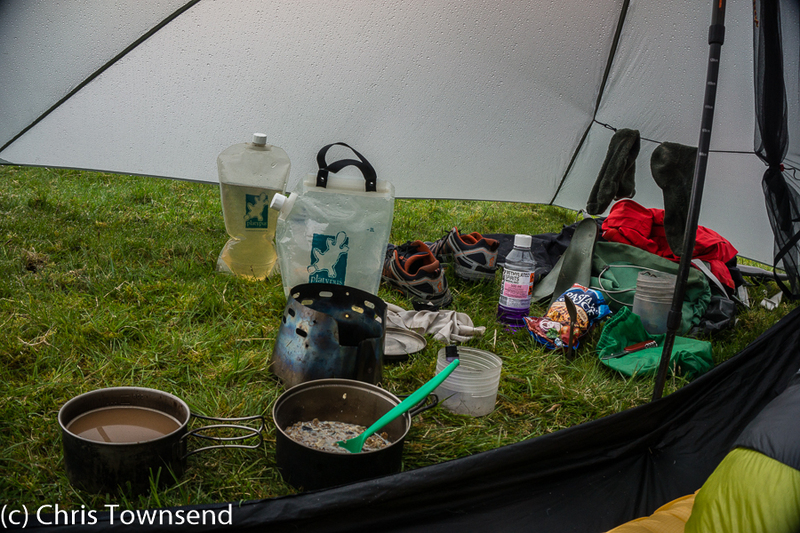 The tent coped well with strong winds, heavy rain and snow. Watershed: Mountain Laurel Designs Trailstar, a shaped tarp, with an OookWorks mesh inner for a total weight of 1.16kg/2.5lbs. 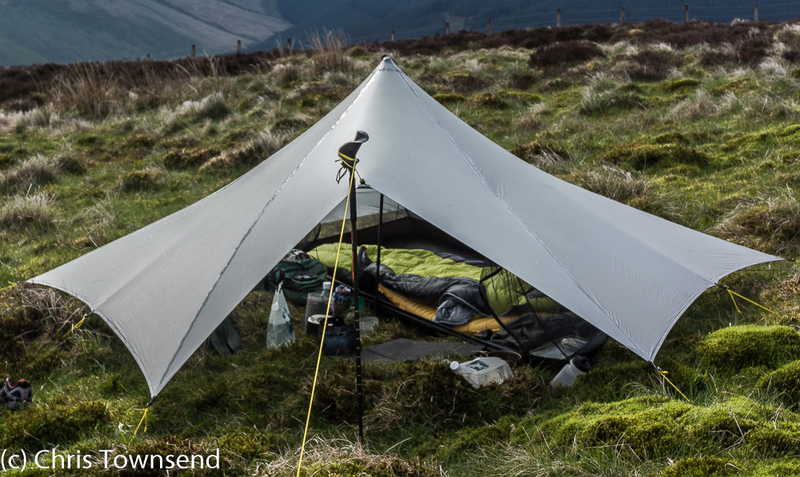 The Trailstar pitches with trekking poles, saving some weight, and is made from silnylon. The Trailstar is much roomier than the Phreeranger and very stable in strong winds. Yukon: Gregory Cassin 125 litre pack weighing 6.5lbs/2.9kg. Comfortable, huge and very heavy. Watershed: Lightwave Ultrahike 60 litre pack weighing 2/7lbs/1.23kg. Comfortable, half the size, light. Watershed: Rab Infinity 300 down bag weighing 1lb 7oz/650 grams that kept me very warm down to +2°C. Yukon: Therm-A-Rest Ultra-Lite self-inflating mat weighing 17 ounces/482 grams. This kept me warm and lasted the whole trip. Watershed: Therm-A-Rest NeoAir XLite Small airbed, weighing 8oz/230 grams. Not as warm as the Ultra-Lite but I wasn’t expecting sub zero temperatures. Yukon: MSR Whisperlite Internationale multi-fuel stove weighing 12oz/340 grams which I ran on Coleman Fuel and similar. I had two stainless pots also weighing 12oz/340 grams. Yukon: Tracks Chief of Staffs single aluminium staff weighing 1lb/454 grams. Watershed: Pacerpole Carbon 3- section poles weighing 1lb 3oz/535 grams that doubled as poles for my shelter. Yukon: Craghoppers Cloudbreaker with polycotton outer and Sympatex lining weighing 1lb 9oz/709 grams. Watershed: Rab Myriad Neoshell jacket weighing 15oz/430 grams. Both jackets provided the same protection and lasted the length of the walks. Comparing these major items from walks 23 years apart it’s noticeable that in all but one case the later items are lighter in weight. Why is this so? We didn’t try to carry heavy packs all those years ago! One of the major factors lies in materials development. Many lightweight materials that are now standard including silnylon and titanium either didn’t exist or were just appearing in 1990. Synthetic fabrics in general have become much lighter whilst maintaining their durability which has meant lighter clothing, lighter sleeping bag shells and, significantly, much lighter pack fabrics. At the same time as materials were changing the ‘ultralight’ revolution started and with it the rise of small innovative cottage designers and manufacturers who experimented with new designs and materials to produce much lighter gear. This coincided with the rise of the Internet, which enabled these new companies to reach a large worldwide audience. 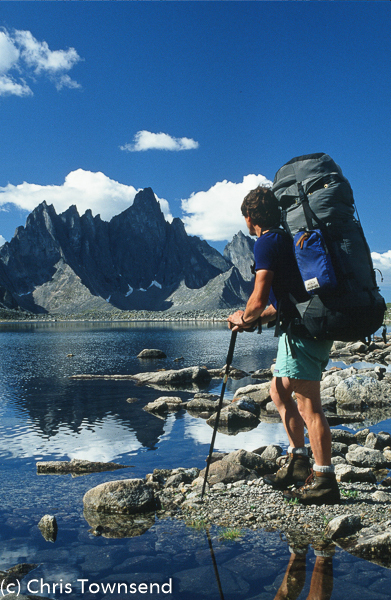 Changes in hiking styles have also had an effect, in particular the growth in popularity of trekking poles. In 1990 using one staff was unusual. By 2000 many walkers were using pairs of trekking poles. And trekking poles meant that shelters with upright poles – ridge tents, pyramid tents, tarps – had a new lease of life having just about disappeared by 1990 after a decade of curved pole tents. 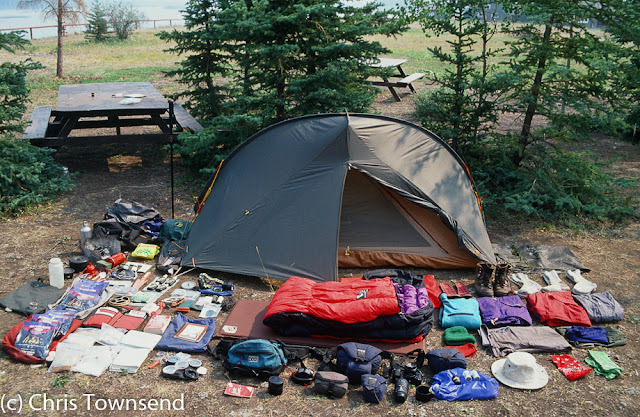 Lighter weight gear also means lower bulk gear and that in turn means packs can be smaller and lighter. On both the Yukon and Watershed walks I carried ten days food at times and had room in my packs. 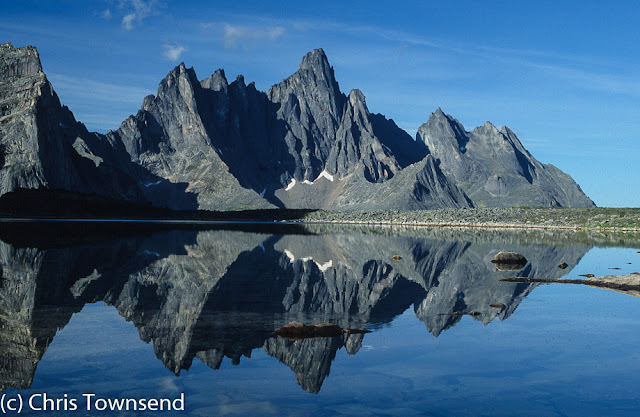 Everything I took on the Watershed walk would have performed well in the Yukon – indeed some of it would have performed better despite being lighter weight. Comparing the items from these walks makes me very glad we have the gear of today, gear that is lighter yet just as functional as the gear from a quarter of a century ago. This piece first appeared, in a slightly different version, in The Great Outdoors Summer Gear Guide last year.